Since I help others with organizing on the cheap, I embarrassed myself when I opened this drawer to grab a bread tie! I don’t know about y’all, but these boxes of sandwich bags, freezer bags, aluminum foil, and waxed paper (who even uses waxed paper anymore – I think I’ve had that roll for years! ), are always taller than my drawer so I smash them down to fit. I’m always re-organizing that drawer! So, I grabbed some little plastic baskets from other random drawers, and went to work. I left some things in their boxes if they fit, but those gallon bags just had to be in a basket. I also tied all the baskets together to keep them stable and put things in order of use – notice that waxed paper is in the back. Now when I re-purchase, I’ll get rid of the cardboard boxes and put the supplies straight into their baskets. If you have one of these crazy, small coat closets that only holds a few coats but are great for catching everything that comes in the front door – take a look at this! I wish this picture was better because you would see the slanted wall on the left that keeps coat hanging or any other organization challenging! In these cases, organization can be horizontal or vertical and you need to put stuff wherever you can! The inside of the door is a perfect place for a shoe organizer to hold all the cleaning supplies. I think people usually keep all their cleaning supplies underneath the kitchen sink. If they’re like me, it gets so full down there that you buy multiples of things because you don’t realize you already have one or more. The shoe organizer is from Dollar Store and is less than $8.00. This hanging organizer is from Amazon (of course, I do love my Prime membership!) and it cost $12.99. 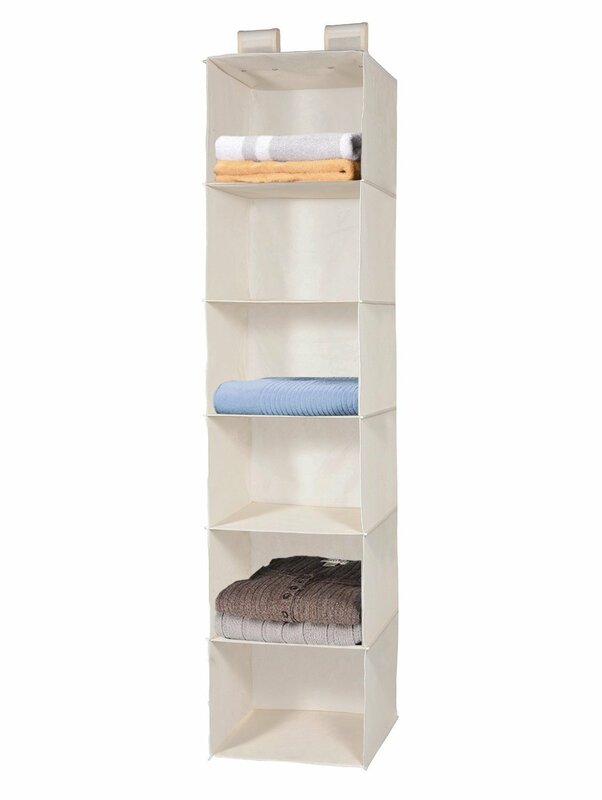 This organizer is perfect for a skinny location – it’s made of fabric and is good and sturdy because the bottom of each section has a reinforced base. It has 2 Velcro flaps that fit the wire shelf in the closet or it fits on a coat hanger well. (I actually bought another one and cut it into two sections to hang in the bottom of my pantry for my paper towels.) As my Mama said, there’s more than one way to skin a cat! I’ve said how much I like to organize and I love it when someone else lets me take over their closets (oldest daughter!). Below is before and after of her office closet. It had no real purpose until she decided to dedicate it to Christmas decorations! The closet is deceptively wide and after measuring and shopping at Dollar General, I was able to get all of her small, lighted inside trees and larger items stuck in the closet to the left of the door. The blue bag on the right is a hanging Glad bag that I can put several more pillows in and it only cost $6.00 at Dollar General. The large clear tubs (35″ long) were $12.00 each and holds several trees and other decorations that were in various boxes and took up a lot of individual space. She already had a three drawer cart on rollers and a smaller four drawer cart that I used to organize ornaments and wrapping paper and bags. After moving some more storage boxes upstairs from the garage, we bought another three drawer shelf from Amazon, 3 drawer and were able to get all most of her huge bonus room tree ornaments stored in the drawers. When she decorates that tree, she can just take a drawer at a time to the tree instead of moving two or three boxes up 19 stairs from the garage! Baskets are great organizers and can range from cheap to more expensive depending on their need. If they are going to carry a heavy load or be pulled and/or pushed around on a shelf, I believe in investing less but finding really heavy ones. Obviously if the basket is only for décor, I’ll spend a little more (the middle row, far right is a little metal wire basket). I frequent Dollar Store for the inexpensive ones and I’m usually able to find them to replace or replenish if needed. The ones on the top middle and right are more expensive and I purchased them at Hobby Lobby a few years ago because I wanted the closet to always look nice. Since they hold sheets and towels for the guest bathroom and guest bedroom, they don’t get a lot of handling. The ones on the left are plastic and are used in pantries and other storage closets. They’re easy to label with paper labels large enough to read from a distance. When I purchased the other baskets, I made sure I could hang a tag on them for labels. I also use cloth collapsible boxes/baskets for my laundry room (Amanzon –storage bins) .